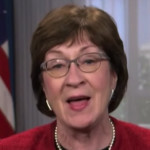 As a key moderate Republican on issues like Obamacare and women’s health, Sen. Susan Collins (R-ME) expressed her dismay over the Justice Department’s efforts to invalidate all of the Affordable Care Act as unconstitutional. Monica Lewinsky on Wednesday retweeted a post by law professor Orin Kerr, who mused about what might have happened if the infamous Starr Report had been handled the same way special counsel Robert Mueller’s report has been treated by the Trump administration. 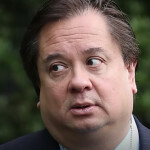 Frequent Trump critic and husband of one of the President’s most trusted advisers George Conway weighed in on Attorney General William Barr’s assessment of special counsel Robert Mueller’s report, which apparently concluded the Trump campaign is not guilty of collusion, but doesn’t exonerate Trump on obstruction. 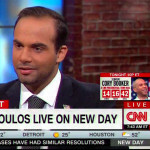 Former Trump campaign foreign policy adviser George Papadopoulos doesn’t blame President Trump or his associates for characterizing him as a “coffee boy” and a “low level volunteer” after he was indicted for lying to the FBI about his contacts with an overseas professor who claimed to have information about Hillary Clinton. 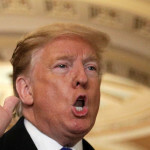 During a private meeting with House Republicans at the White House on Tuesday, President Trump fumed about his new favorite target — Rep. Adam Schiff (D-CA) — as well as his longtime foe — whom he appointed — Federal Reserve Chairman Jay Powell, according to Politico. Former Trump campaign foreign policy adviser George Papadopoulos told Reuters on Tuesday that his lawyers applied for a pardon from President Trump and, after serving his 14-day jail sentence, he’s mulling withdrawing his guilty plea for lying to the FBI. White House counselor Kellyanne Conway joined Sen. Lindsey Graham in his calls for an investigation into the FBI’s handling of the infamous dossier, but took it one step further by pushing for a probe into the Obama administration’s handling of Russian interference in the 2016 election. The Pentagon notified Congress on Monday evening that it had transferred $1 billion of its budget to the Department of Homeland Security for new border wall construction along the U.S.-Mexico border, CNN reported. 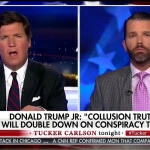 The President’s son, who was at the center of the June 2016 Trump Tower meeting with a Russian lawyer, celebrated not getting indicted on Fox News on Monday evening.